PLEASE everyone make sure to post in the discussion thread! If something is not clear, also feel free to ask there or PM me, Eliea! This is an ongoing swap, feel free to join up at any time this month! To join, first send a Personal Message to organizer Eliea and co-organizer tcha345 with the following questionnaire info. Once you are approved, you are free to claim something(ie one item) from the most recent list posted, and then post your own list. Do not sign up unless you are willing to send outside of your country. This round of the swap will close around midnight, on the official Craftster clock, October 31st. Feedback will be given on November 1st for all participants who have no pending claims. Everyone whose packages haven't been received will get feedback once the package reaches its destination. 1. Make sure to PM both me and tcha345 and who you sent to when you send out, with DC number if you are both in US. 2. Make sure to PM both me and tcha345 and who you receive from when you receive. Late without communication. PM me immediately! Andriod raptor to Riechan-2 Origami anime dolls:1 super Sailor moon/ usagi and 1 shindou shuichi please. littlebiskit to riechan- geek love necklace? Last List was posted by Sajona so that will start our round. I'll claim your silver linen! NEW Little bag (12" approx deep) with wood effect handles, padded with denim lining and a little pocket inside. 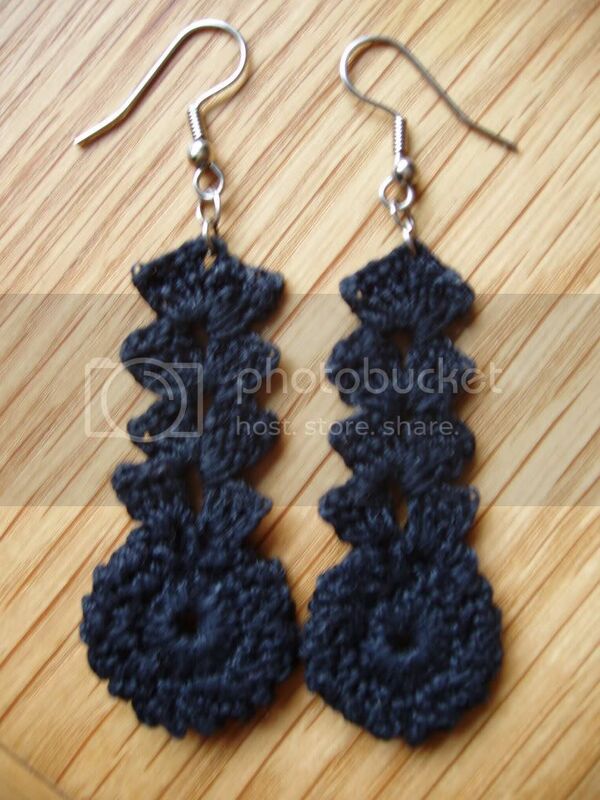 Made from Amy Butler fabric. A bit of a 'second' as I was experimenting with a new shape and it doesn't hang very well - useful for storing small craft projects or even pegs for the washing line! 3 copies of Discovering Needlecraft magazine - lovely partwork series that include the cover kit. Or 4 copies without a cover kit. Selected at random! 3 nylon mesh ‘ball bag’ kits from wazoodle com. Include cord and toggle for fastening. Make huge bags to store balls, outdoor cushions etc in – won’t be ruined by damp etc. I have 2 sets. These were in the corners of a preprinted tree skirt. They are meant to be coasters perhaps? Teresa Kogut bears, wadding and Christmas fabric backing. Pick any two for one claim. Novelty fabric pieces, PM for details on the sizes of the pieces. Most are not big enough pieces for clothing. FYI, I got these all from a friend, they were not my own purchases. Also, I'm not good with names of fabric, but I can tell you if they stretch or not! A group of animal print. The top two have some stretch, the bottom doesn't have much. 80's snake print. There's actually quite a bit of the pink, and just a small bonus scrap of the pink/black. They are both knits. I would like to claim the decoupaged mirror please! Also the keyboard key necklace. from a non-smoking, pet free home. the fabric was given to me but I have no use for it and i'm not sure of the exact amount here, but it's definitely a bunch. I can make beanies similar to this one, in a multitude of colors! 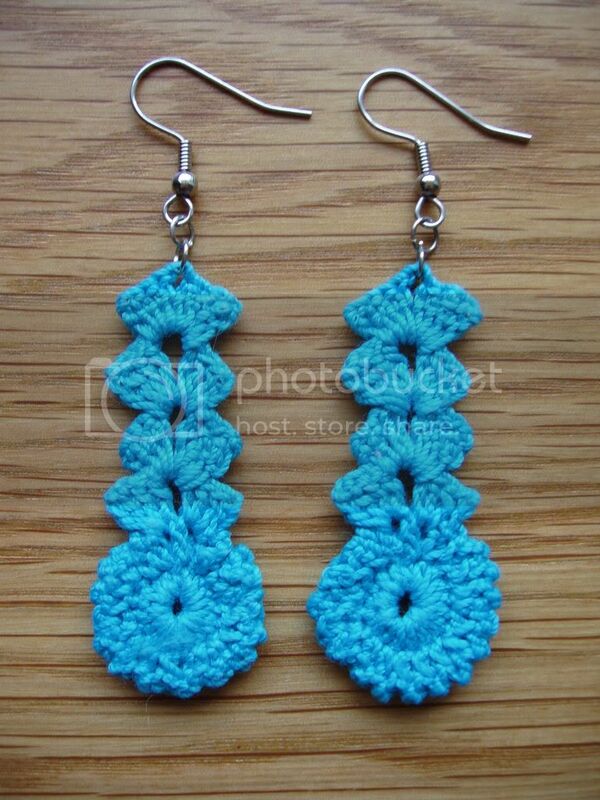 Or you can choose this one! I'd like to claim the kitty fleece please This is my 1st claim this round. 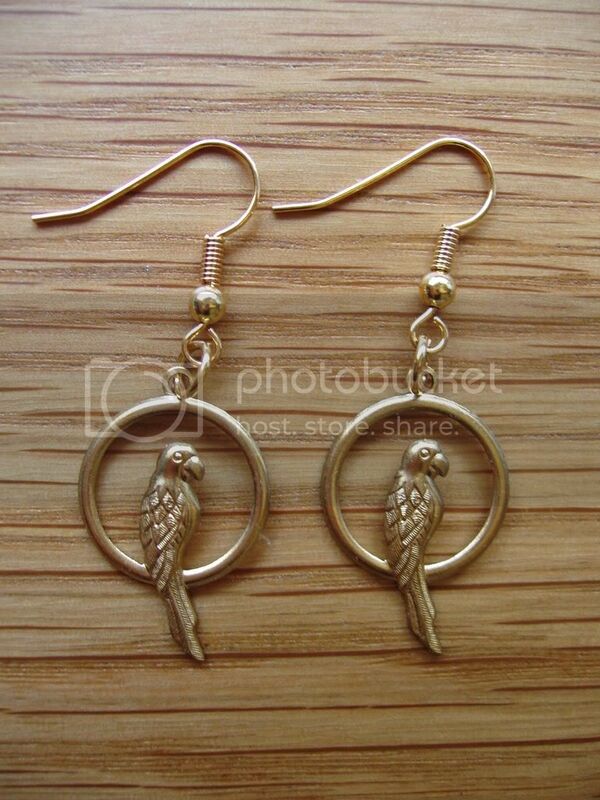 Brass parrot earrings with gold plated hooks. 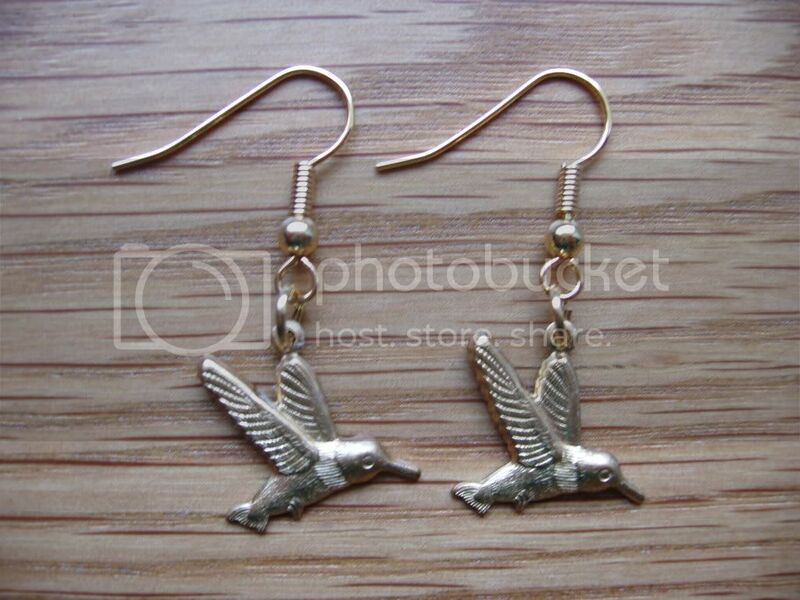 Brass hummingbird earrings with gold plated hooks. 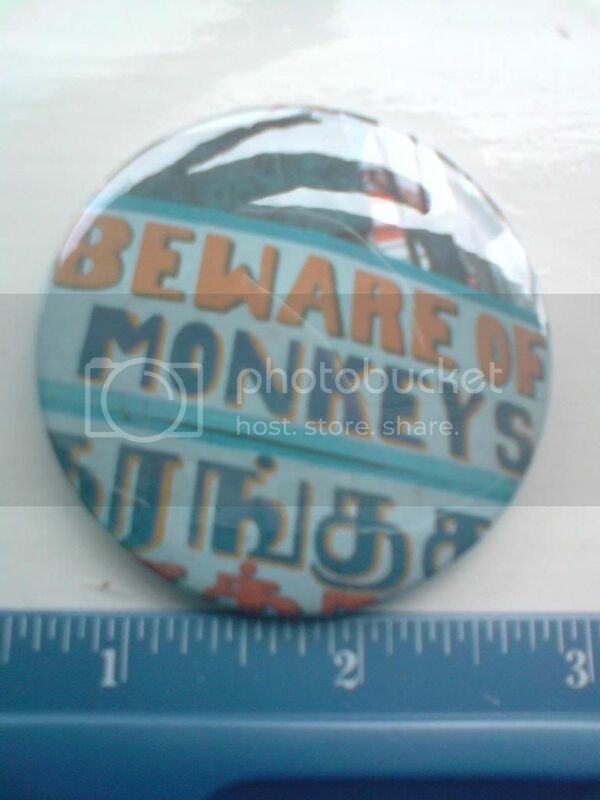 I'd like to claim the coasters and the beware of monkey mirror. I actually have 4 of these, the one in the picture has a little sewing on it, the other three do not. This does have a slit cut in it a couple inches from the print on the top. Sorry, it came to me that way. 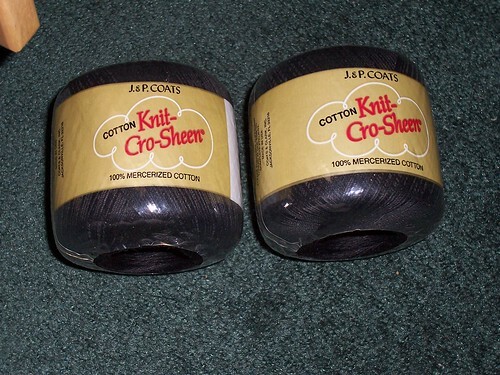 2.5 balls of black crochet cotton - 1 claim. Stuff your own carebears, I have several types. As you can see, grumpy is already cut and stitched. I can stuff him for you if you want. Garter stitch and crocheted scarves, trying to destash fun fur! 1/2 claim each. The middle two are child sized, the outside two are adult. Beads and such: Unopened pink seed bead package, fake pearls (cheap kind but lots of them) and 1 ball of crocheted nylon: 1/2 claim each. 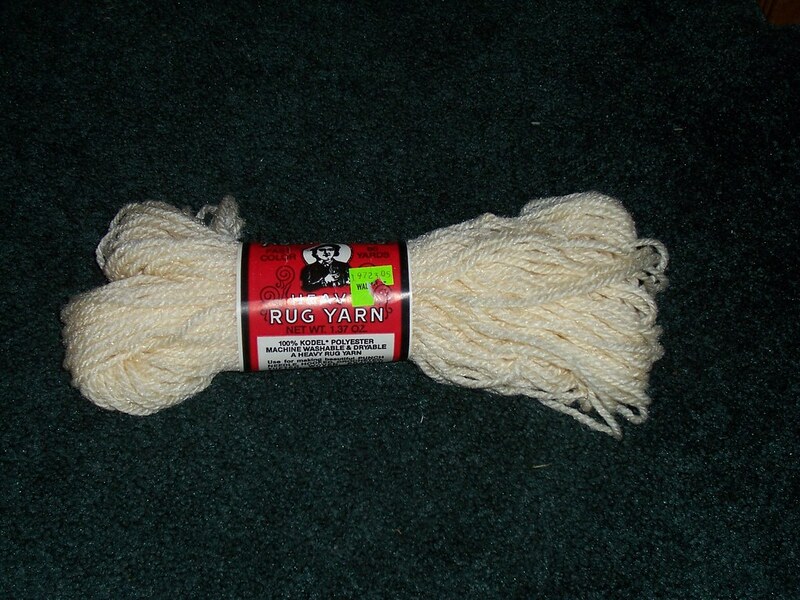 5 balls of rug yarn for a half point. I think I actually have 16 of these or so. Some of them are wound into balls and came to me that way so I can't guarantee full yardage on some of them but they look like they are all there. I'm told it works really well for pet stuff but I don't have any pets. I have a ton of blockbuster backer cards. Some fairly recent movies some older ones. I'll send you 5 for a half claim or 10 for 1 claim. I can try to send a certain genre if you have a preference. I claim gueneverefree for the pink kids scarf and the crocheted adult scarf!